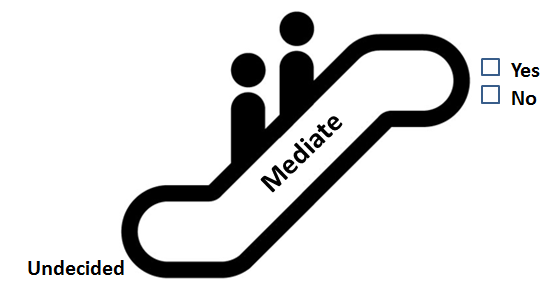 Use mediators to escalate conflicts up to the point where everyone can make informed decisions. Mediation is designed to bring people together, and keep them together long enough to engage in a meaningful discussion that is designed to escalate conflicts up to the point where informed decisions can and will be made faster on how to resolve the conflict privately out of court. It’s never premature to ask the tough the questions. Procrastination won’t solve lawsuits and disputes and, in most cases, neither will lawyers and judges. More than 95% of all cases are settled out of court by a private negotiation. Mediators are often hired to quarterback these settlement negotiations. They know how to ask everyone the tough questions to help lead both sides to gain a much clearer and faster understanding of opposing views and interests. The goal of mediators is to restore communications and bring everyone to a point where they are able to make a decision. A good mediator will review in detail, both the strengths and weaknesses of all sides to a case make sure everyone understand what outcomes are possible or impossible in court. A good mediator should help formulate and present at least one or more out of court settlement proposals. Done right, people leave mediation with no doubt that they accomplished more during a few hours in mediation than they could otherwise accomplish fighting for months if not years in an adversarial lawsuit. You can choose the short route or the long and winding road. People naively believe that, once an agreement is broken, all communications must cease and everyone should now wait and rely on lawyers and judges to tell them when to speak, what to say and exactly how to say it. However, you don’t have to wait. Time is money. Cut to the chase. Mediation enables everyone speak confidentially and to say exactly what they want and why. Litigation is the long and winding road, a round-about way to get to the point. Mediation, on the other hand, is a short, focused, legally enforceable private conversation and negotiation that you can order at any time. Mediation conferences are regularly conducted by trained professionals who are legally required to remain neutral and unbiased and to provide everyone with a fair, flexible, confidential opportunity to speak and be heard. Good mediators are proactive, creative, problem solvers and statistics show that most disputes that are mediated are settled at mediation. READ MORE. Even if your case is not settled at mediation, you’ll be a lot closer. You should leave with a clear understanding what’s possible, what’s reasonable what to do next to move closer to an agreement. < Previous Establish your leverage upfront. It can be very difficult and expensive to try to get it later. Next > How to reconcile the forecasts held by plaintiffs and defendants in litigation. Do you get more “justice” through litigation or mediation? Litigation is one of the most in-efficient processes left on earth. There can be no agreement absent a fair exchange of trust between both sides. When it comes to resolving disputes, its never a good idea to be too full of yourself. Mediators keep the parties, the lawyers and the dispute resolution process honest. When you are trying to settle a lawsuit, don’t lose sight of the elephant in the room. Mediation provides for the safe and secure use of confidential information to resolve lawsuits and disputes. How to reconcile the forecasts held by plaintiffs and defendants in litigation. Establish your leverage upfront. It can be very difficult and expensive to try to get it later.